The examples show Tai Chi being performed and taught. 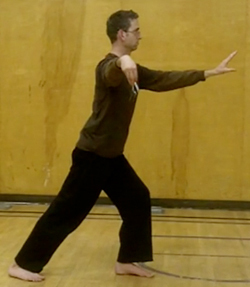 They are provided as a courtesy of and are copyright by the Shen Dao Tai Chi & Lok Hup Academy of Edmonton. They may not be transferred to any other website without the written permission of Richard Williams or Paul Bromley. Richard Williams demonstates opening moves 1 to 25. Paul Bromley demonstrates moves 1-6 with details voiced by Richard Williams.